To install and work with a local copy of PHP-Fusion, simply download a copy of XAMPP for your given environment ( Windows, Linux or Mac ). You need to create a MySQL database. 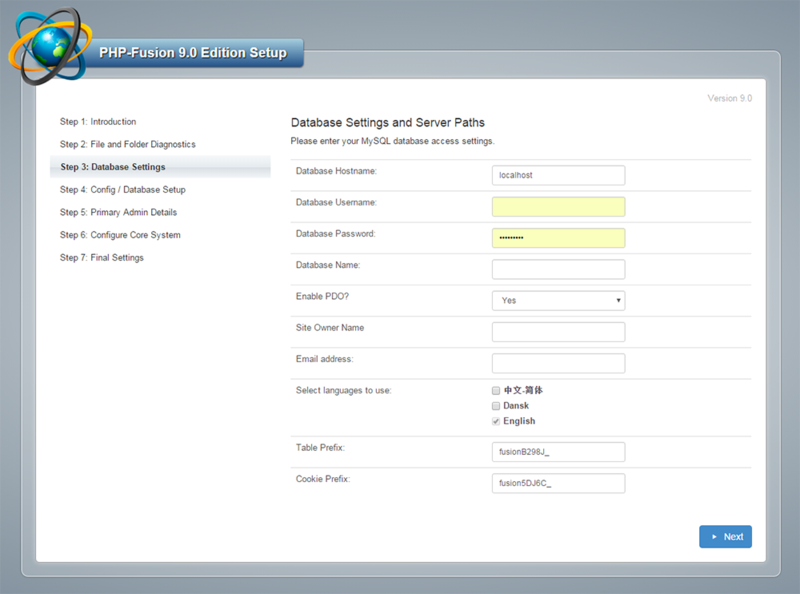 You can do this via your web hosting´s control panel or phpMyAdmin. Make sure you have your MySQL access details at hand including the hostname, username, password and database name as you will need to specify these during setup. Before you start the installation of PHP-Fusion you must upload all the files to your hosted directory and set the correct permissions for the files listed below. Note: Some hosts does not allow CHMOD 777, in that case you can use CHMOD 755 if CHMOD 777 fails. This can be done either in your FTP program or from your hosts control panel. 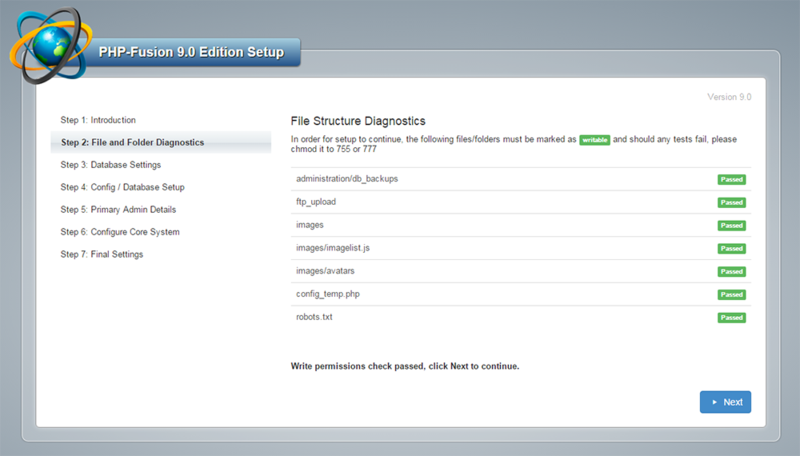 To begin the installation PHP-Fusion you need to open your web browser and navigate to your site. example: www.yourdomain.com/install/index.php. Into your browsers address bar. Select your default language for the site. If you wish to install your site using a different language or if you want to use multiple languages, you need to first download the desired locale files from our Github. You can always add an unlimited amount of languages or change the default system language at any given point later from the Language Administration. You must Agree and check the box after "I have read and agreed to the PHP-Fusion terms and conditions use". If any are marked Failed, You will need to go back and re-check the correct permissions as set out above. You will not be allowed to continue to the next step until this is done. Once you are ready and everything is set, click next to go to the next step. Enter in your database information, leave Database Hostname set as "localhost" unless otherwise told to by your host. PDO is selected automatically if the installer detects this as available. The table and cookie prefixes are randomly generated as a security measure. You do not need to alter these settings. However, you can enter your own prefixes if you wish to do so. The only stipulation is that they are random letters and numbers and are unique. If you are unsure, leave them as they are. If for any reason, you receive a warning message, go back and re-check that you have entered the correct details and that the database (MySQL) user has read, write and delete permission for the selected database. You may need to contact your web host to check this for you. Once done click next. 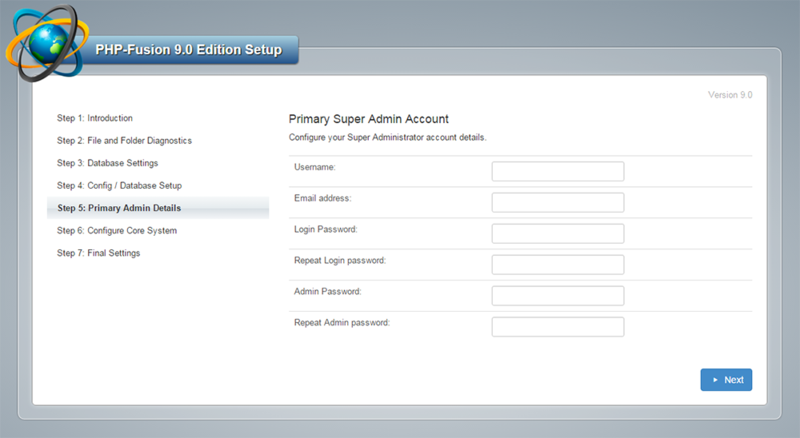 You now need to enter the details for the Primary user that we call Super Administrator. It is recommended that you as a Super Administrator use random letters, numbers and characters to prevent anyone ever gaining access to your account as the first Super Administrator has complete access to every section of the site. Do not use your name, date of birth or part of your phone number or any other personal details that can be guessed by others. All the main browsers have built in password managers, thereby relieving you of the need to remember them. The Admin Password is your password to enter the Administration Area, this password should also not be easy to guess. After entering in your details, click next. Your database tables have been successfully created and populated with the required default data. 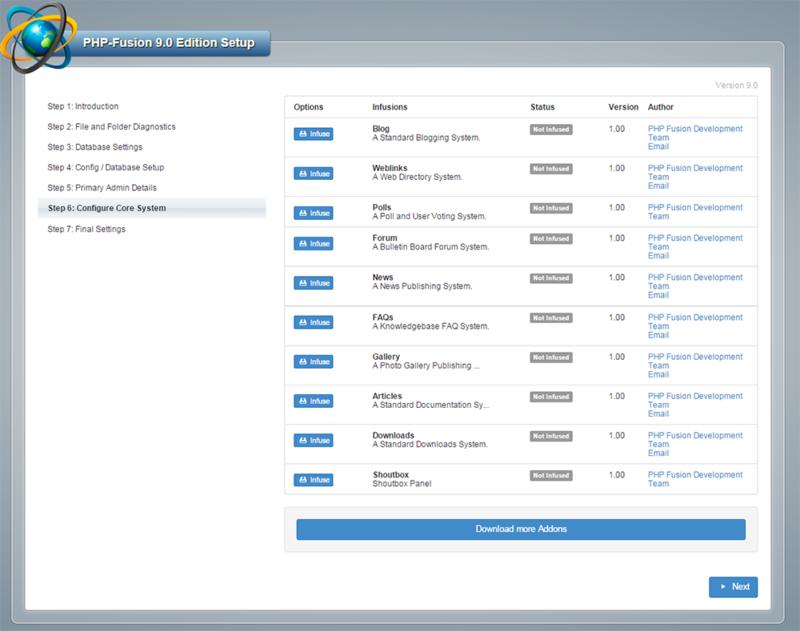 You can now select what Infusions you want pre-installed or simply click next to complete the installation. Infusions can always be managed at any given time from your System´s Administration Interface. There are still a couple of things you need to do. First, log in to your site using the login details you entered in step 5. When entering your site, you will see a warning reminding you to delete the /INSTALL/ folder immediately. It is recommended that you do this just to be safe. Finally, reset the permissions for config.php back to 644, this is very important for the security of your site. Your site is now fully installed and ready for you to start adapting it to your needs and to make it your own. You can find Addons in our AddonDB for your site.